It is that time again where another calendar season is upon us....and I am very excited! 2010 was a great year...over 16,000 calendars were sold. That is incredible for this small town SK girl. I am so blessed to have been able to bless so many wonderful people with fond memories of SK with the SK Prairie Scenes B&W calendar and my 1st SK Classics Calendar and also through the 2010 Inspirational Holy Land. 2011 Saskatchewan Prairie Scenes calendar with great photos from across our great province. 2011 Saskatchewan Churches Inspirational calendar with photos which portray the Spirit of God that many SK communities testify through the beautiful churches that are such great presence among them. 2011 Saskatchewan Classics featuring more great photos of classics that we are able to enjoy driving around it. 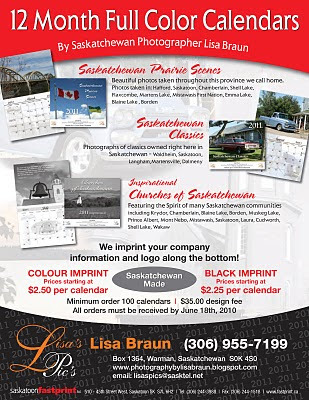 These calendars will be sold from January - June 18, 2010....printed right in Saskatoon, SK in the summer months and then distributed out to your businesses in September, early October. The cost is $2.25/calendar with black imprint of your business information and logo and $2.50/calendar with color imprint. The cost of the design fee is $35.00 in order to set up your business logo and information on the bottom of the calendar. 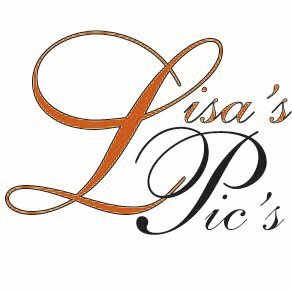 Photos that will be featured in these calendars will soon be posted. I look forward to serving you again in 2011 with these beautiful 2011 Saskatchewan Calendars.